As grassroots organizers mobilize across the country for stronger gun control, the Senate majority leader throws down a crucial marker. After the Senate was unable to muster enough votes in April and pass a comprehensive gun control package, reformers immediately set to work pushing for another bill, particularly one that deals with universal background checks. It was unclear when—or even if—this would happen, but this morning Senate majority leader Harry Reid provided a huge clue. During a private meeting late Thursday morning with Moms Demand Action for Gun Sense In America, which The Nation was allowed to observe, Reid predicted a vote on background checks would happen again in the Senate before the midterm elections, though no sooner than 2014. Moms Demand Action founder Shannon Watts asked Reid directly if there would be a background check vote before voters head to the polls in November 2014. “I think sometime next year we’ll revisit that issue,” Reid said. “I’m almost certain of it.” He noted it couldn’t be this fall, due to the complicated spending issues Congress has to tackle involving bills to fund the government and lift the debt ceiling. Though some House Democrats said in the immediate aftermath of a vote that Reid had told them a vote would happen this year, it’s nothing he said publicly nor that his office confirmed—instead, Reid was decidedly vague about the timing. He told the Newtown Action Alliance in June, for example, that “Background checks will pass the United States Senate. It’s only a question of when.” He also predicted in May that background checks would get “a couple more” votes now, whenever the second vote was held. Reid’s prediction now of a pre-midterm election vote on gun control is crucial, because it means senators who oppose background checks will have to declare their opposition in the heat of a campaign cycle. Universal background checks maintain sky-high public support—and grassroots organizers and outside groups are leaning into the issue hard. 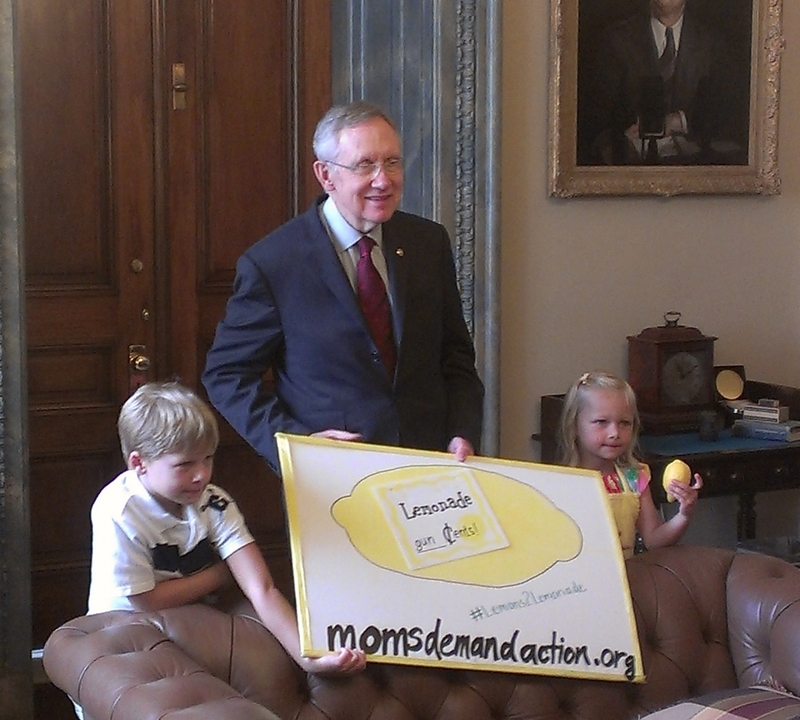 For example, before meeting with Reid, Moms Demand Action held a two-hour “lemonade sale” outside Congress on Thursday morning, and invited lawmakers to come by and speak to the assembled mothers about gun control. Several members of the House and Senate did, and urged the group to keep pushing. “I beg of you, keep doing what you’re doing and keep asking for action to take place,” Representative Mike Quigley told the group. Moms Demand Action sprung up early this year during the post-Newtown gun control debate. It’s entirely grassroots, with no organizational or big-donor support beyond the members who have mobilized. The group has 100,000 members in 100 chapters in forty states. While some of the members have lost their children to gun violence, many are simply concerned moms. The explicit role model for the group was Mothers Against Drunk Driving, which has successfully mobilized for tougher DWI laws across the country. Watts, who was a stay-at-home mother in Indiana with five children, founded the group after she assumed a MADD-like group against gun violence existed, but realized it did not. She told The Nation before the “lemonade sale” that an experience with her 13-year-old son shortly after the Aurora, Colorado theater shooting was the main catalyst. “He went to see Batman the day after, and he had accidentally been exposed to [the shooting] on television. We weren’t going to obviously tell him about it,” she said. “And he became so frightened during the movie that someone had a gun, and he started having a panic attack. And he fled the theater. And he actually started going into very intensive counseling, he wasn’t able to sleep by himself, and it took months and months and months. Because I think he realized that he was not safe. “So when this happened I just thought, this is such insanity,” Watts said. Meanwhile, New York City Mayor Michael Bloomberg vowed again this week to keep pushing for tougher gun control laws at the state and federal level. Former Representative Gabby Giffords’ group just announced that it raised $6.6 million this year, and is gearing up for the midterm fight. But it sounds like there will be a vote first—and with increased mobilization and strong public support, the chances for success are certainly higher.